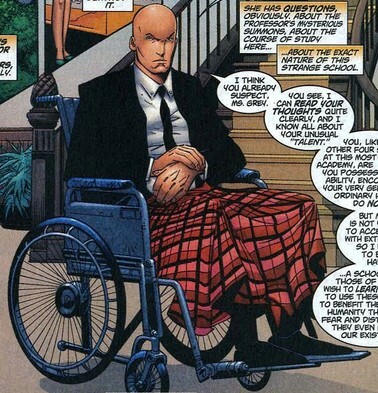 This week’s minorities in cartoons entry is Professor Charles Xavier (also known as “Professor X“), the founder and leader of the famed mutant superhero team the X-Men. Professor Xavier’s first appearance was in the very first X-Men comic, “The X-Men” #1 in September 1963. Stan Lee and Jack Kirby created Charles Xavier. The following is a greatly shortened and glossed-over summary of Charles’ backstory. If you want the whole thing in detail, try Wikipedia, Marvel.com or the Marvel wiki. If you want a snarkier-but-funnier version, try this “Comics, Everybody!” strip. But anyway: Charles was raised by his mother, who’d remarried after his father’s death. This gave him not only a stepfather (who eventually died in an accident), but also a stepbrother, the bullying Cain (a.k.a. the future villain Juggernaut). Excelling in school and athletics, Charles finished his studies at a young age. Charles served in the Korean War alongside Cain. (During the war, Cain somehow stumbled across the source of his Juggernaut powers.) After the war, Charles traveled the world. This included befriending (and parting ways with) the future Magneto, and studying the nature of mutation. Charles also defeated the attempted invasion of Earth by an alien named Lucifer (not the Lucifer, apparently). In retaliation, Lucifer dropped a large stone on Charles, crushing Charles’ legs. After a battle with an evil mutant and a brief telepathic encounter in Egypt with fellow mutant Storm, Charles decided he should dedicate his life to helping other mutants learn to use their powers for good. He also wanted to help humans and mutants coexist peacefully. Returning to the United States (and the site of his ancestral home), he founded Xavier’s School for Gifted Students. He took in and trained the students that would make up the initial team of X-Men: Iceman, Angel, the Beast, Cyclops, and Jean Gray. Over the years, the X-Men’s roster has changed numerous times; there’s also been a metric ton of spin-off teams. As a mutant, Professor Xavier is one of the most powerful telepaths on Earth, possessing a wide array of telepathy-related powers. Xavier occasionally makes use of “Cerebro,” a special computer that amplifies the range of his powers, letting him scan the Earth for other mutants. The nature of Xavier’s wheelchair has varied over the years, varying between a conventional one and a high-tech hovering model. Xavier’s usually appears in X-Men related media spin-offs. Xavier’s most prominent appearances would be the live-action series of “X-Men” films in the 2000s and 2010s. Xavier was initially played by Patrick Stewart (Captain Picard from “Star Trek: The Next Generation”). Later films had actor James McAvoy play a younger version of Charles. Ironically, Stewart’s been the one live-action actor most associated with Xavier, even before the films were made. Various fans, comic magazine polls, etc., during the 90s felt he’d make a great Charles. Next Post:July 2014’s top-selling comic is…Rocket Raccoon?